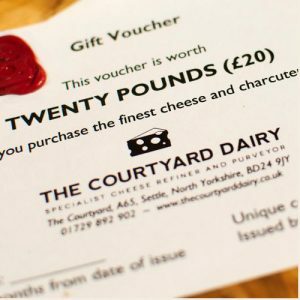 "Everything here is as good as it can get"
Since The Courtyard Dairy’s opening in 2012, owners Kathy and Andy have won many awards and helped to promote British cheese in a multitude of ways. Read about some of their many awards (including 2013 World Cheese Awards Cheesemonger of the Year) and view their press articles below and here on the press clippings page. The Courtyard Dairy cheesemongers know the background and the stories behind the cheeses they sell, by making regular visits to the cheese-makers, talking cheese with them, and helping with the production. The knowledgeable background of The Courtyard Dairy cheesemongers includes a scholarship in Cheese Maturing from The Queen Elizabeth Scholarship Trust, an apprenticeship in Affinage (cheese ageing) in France, together with working for some of the UK’s top cheesemongers, from Borough Market to deep Cheddar country in Somerset. Find out more here. Click here to read what the press say about The Courtyard Dairy. 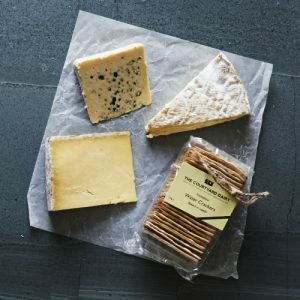 Once the cheeses have been selected from the farm, that’s not the end of the story: the whole of The Courtyard Dairy shop is specially equipped to mature specialist cheese to its best. It’s not just simply a case of letting cheese ripen – each cheese has it’s own special requirements, from the environment it is kept in, to its day-to-day care, such as turning, brushing and washing. Find out how this is carried out to perfection at The Courtyard Dairy. The Courtyard Dairy sells unpasteurised cheese every day in their specialist shop near Settle, so when you buy cheese online, each cheese will be cut fresh from the wheel the day before it is delivered direct to your door. No cutting corners, no compromise on quality or excellence. The Courtyard Dairy stocks and supplies a carefully chosen range of unusual and exquisite farmhouse cheeses, selected direct from individual farms, and then only if the cheese is superior in quality and taste. No compromises. 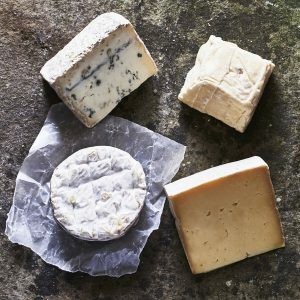 For the best depth of flavour, these specialist cheeses are still made by hand on the farm, with most farmers using their own high-quality unpasteurised milk from a single herd of animals. Many of these farmers have less than 70 cows (the smallest producer has just 7 goats!). The Courtyard Dairy’s cheeses are among the finest to be found anywhere in the world.